Raita is a very simple, tasty Indian salad made with yoghurt and seasoned with herbs and spices. It is prepared by mixing vegetables or fruits with beaten curd and requires no expertise. Its cooling properties make it a perfect accompaniment with spicy dishes. 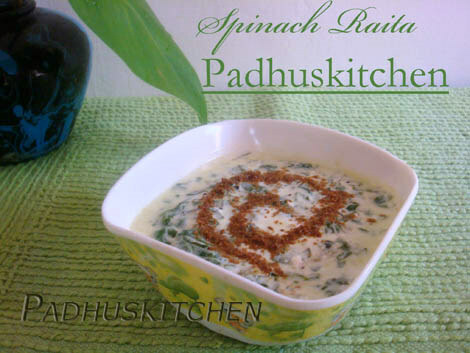 Today let us learn how to prepare palak ka raita using our easy palak raita/spinach pachadi recipe. Remove the thick stem of spinach and discard it. Use the leaves alone. Wash the leaves and chop it finely. Heat oil, add mustard seeds, when it splutters, add finely chopped onions and green chilli. Sauté for a few minutes, then add spinach leaves and cook till it wilts which takes only a few minutes. Leave it to cool. Whisk curd and add to the above. Add salt needed and mix it well. Garnish with roasted cumin powder and serve chilled with any pulao or biryani. For roasted cumin powder - Dry roast cumin seeds in a pan on medium heat. Once you get a nice aroma of roasted cumin seeds, switch off the heat. Let it cool completely. Then powder it finely. never had this but want to make next time am makinf raita. healthy raita, haven't tried with spinach.. Healthy version raitha looks so inviting! lovely and healthy raita, love it..
That is one yummy looking raita:-) Healthy for sure! This is one healthy raita..